You might remember that one of my criteria for getting a new Batman figure is that it doesn't look like every other Batman. Mission accomplished! 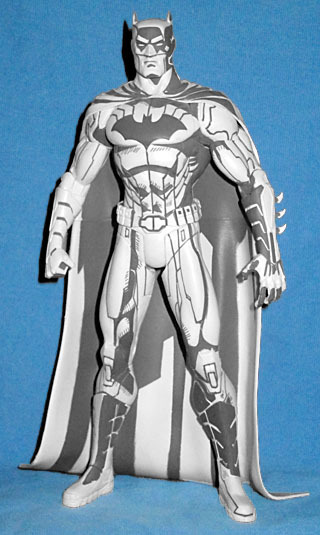 This figure, officially named the Jim Lee BlueLine Edition Batman, was an exclusive at SDCC 2015. But I didn't conscript Rustin into getting one for me, because I know what a colossal hassle and waste of precious time it is to get any of DC Direct's exclusives - I figured I'd take my chances on Action Figure Xpress or Big Bad Toy Store after the show, if I really really wanted him. But then something unexpected happened: retail availability. For whatever reason, mega-bookstore Books-A-Million has received a bunch of this year's SDCC exclusives. First was the black & white TMNT Minimates set, which we'd already reviewed, but it was still surprising to see. A week later, they had the Gotham set, and after that, Ant-Man. So a whole lot of Minimates, basically. But also this Batman! Doesn't having this in a real store defeat the purpose of it being an SDCC exclusive? Maybe, but not much more than it being available on various websites, I guess. On with the review! Blue Line, in case you don't know, is the name of the company that makes most of the art boards used by professional comic artists. And they take their name from non-repro blue, a color that cameras and printers are designed not to see, allowing you to write or draw eithout having to erase every little line. So this may be "BlueLine" Batman, but that doesn't refer to his color. This figure shares its mold with the DCD Justice League New 52 Batman, a figure we never reviewed, because it wasn't as good as Mattel's version. 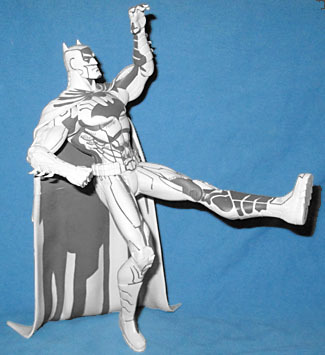 Batman was sculpted by Jack Matthews (who is apparently not the same person as DCD's other go-to guy, Jonathan Matthews). It's harder to judge the detail on this figure than it was on the original release, thanks to the paint, but if you really get in there and look, it's impressive. The armor panels that make up his suit have sculpted seams, and the ridges on his boots and gloves are raised. The pouches on his belt are right next to each other, rather than having space in between, and his belt buckle is large. The spikes on his gloves are sharp and wicked-looking, like tiny talons. This is a much better sculpt than Mattel's. The articulation, however, is not. This figure is bit of a backslide for DC Direct, who have been doing really good articulation lately. Batman has a balljointed head, but it's so stiff that like the neck is going to break. His shoulders are swivel/hinges, and his biceps swivel. He's got hinged elbows, but no wrists, and of course no waist. The hips are just a T-crotch swivel, and other than the single-hinged knees, there's no other articulation in the legs. This is a figure that will stand in place, not one that's fun to play with. And that's why I never bought the normal release - but this one has paint in his favor. Since this toy is named after a brand of art supplies, the idea is to make him look like rough, unfinished art. The effect is far from perfect (if it's supposed to be a sketch, shouldn't the lines be sketchier? ), but it's still very striking. 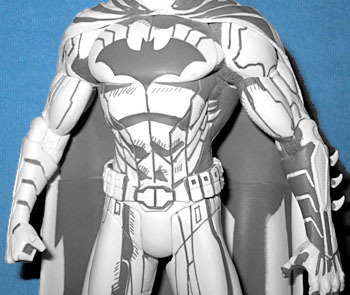 Batman is molded entirely in white plastic, then given some grey paint meant to look like the shading Jim Lee would give the figure if he were drawing it. This ends up as big, chunky shadows, and some outlining of panels. 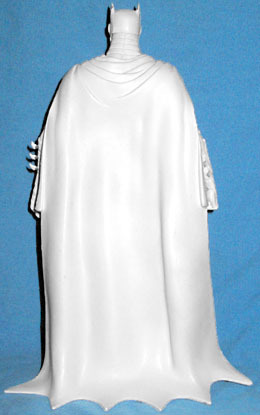 The paint is heavier on the toy's left side than on its right, suggesting we're meant to view it from that side - the details get minimal anywhere you're not meant to look, to the point where his cape (ie, the back of the figure) is pure white. Batman drawn on it. The accents are done in a pale blue (which is only mimicking non-repro blue, because that specific color doesn't have an exact Pantone match). The box hinges open, with the toy on the right side and a Jim Lee Batman print on the left. Yes, everybody gets the same one. There were also 150 "limited edition" versions available (for $300) that featured a real Jim Lee sketch of either Batman, Joker, or Harley Quinn. Honestly, this is a case where we would approve of going with the old Mattel "random hidden variant" method - still do the 150 sketches, but pack them out randomly, so you don't know what you're getting until you open it. BlueLine Batman is more of a display piece than an action figure, but what a display he is! We wouldn't mind seeing more figures like this in the future.